ஸ்ரீமன் நாராயணனுக்கு மணம் தரும் நன்மலர்கள் மட்டுமே சமர்பிக்கப்படுகின்றன. Flowers are considered important in our worship. We offer flowers to our Gods. Blooming flowers are one of the most beautiful things you can see in nature. 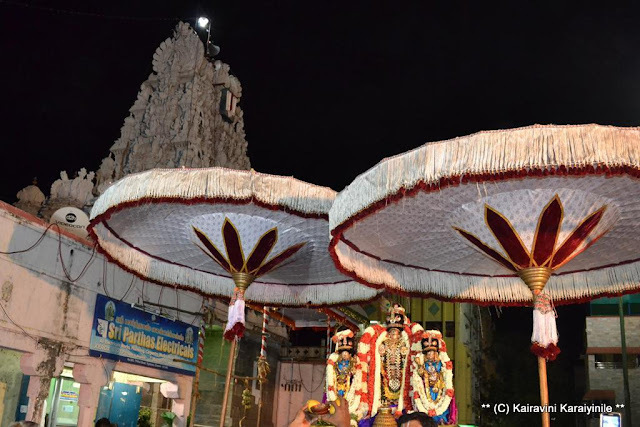 After 10 days of Brahmothsavam, it is rest called ‘Vidayarri’ for Sri Thelliya Singar - and after 3 days of rest, comes the florally bedecked ‘Pushpa Pallakku – the palanquin with flowers’. 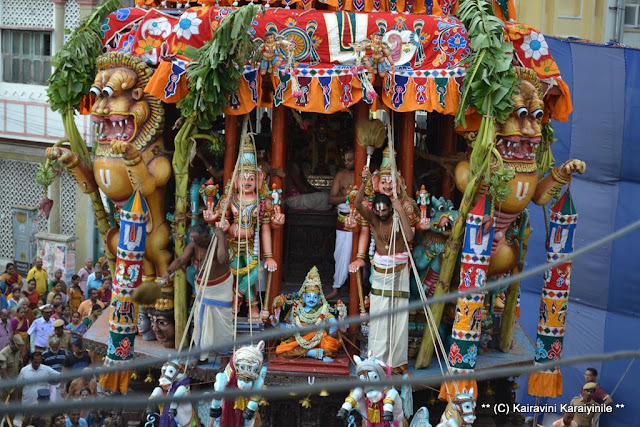 The floral palanquin looks beautiful and pervades goodness all around – treat to the eyes, ears and senses of Bakthas. 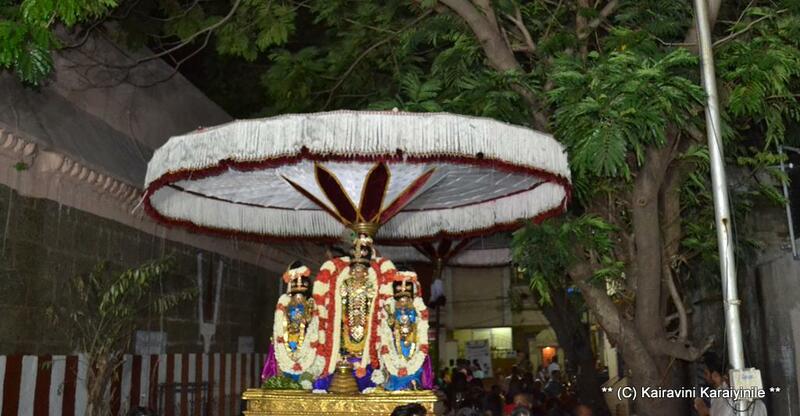 I had posted in detail about the pushpa pallakku purappadu for Sri Azhagiya Singar at Triplicane [Thiruvalikkeni divyadesam] on the night of 27th June 2016 – and many of my friends had responded expressing their happiness on seeing such a beautiful palanquin. 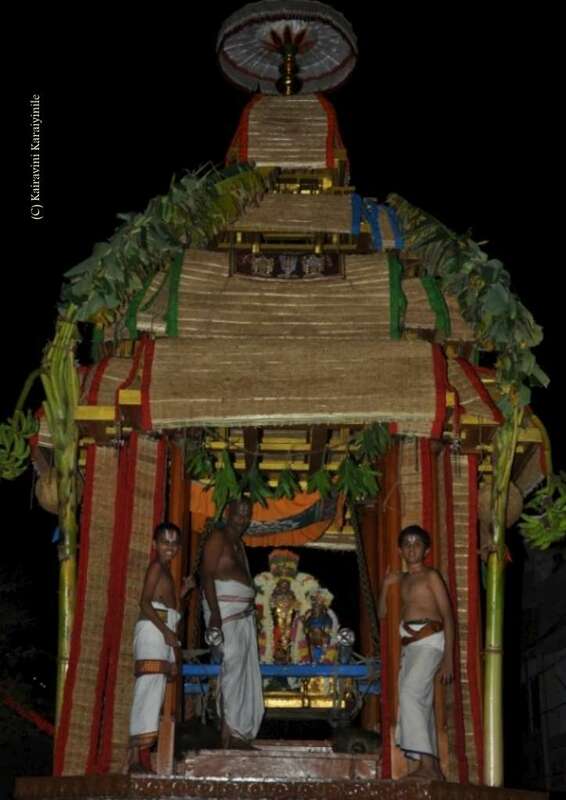 .. .. still, it is simply materialistic – now, look at our most beautiful Sri Thelliya Singar with ubayanachimar proceeding in purappadu from His sannathia through Peyalwar kovil street to vahana mantapam for pushpa pallakku purappadu. Now, none needs to tell us, what made that pallakku beautiful ! ஸ்ரீமன் நாராயணனுக்கு மணம் தரும் நன்மலர்கள் மட்டுமே சமர்பிக்கப்படுகின்றன. ஏனைய நறுமலர்களை தவிர, குங்குமப்பூ அரைத்து சாற்றப்படுகிறது. குங்குமப்பூ (Saffron) என்பது குரோக்கசு என்னும் இனத்தைச் சேர்ந்த சாஃப்ரன் குரோக்கசு (saffron crocus) என்ற செடியின் பூவிலிருந்து தருவிக்கப்படும் ஒரு நறுமணப் பொருளாகும். இப்பூவின் உலர்த்தப்பட்ட சூலகமுடிகளும் சூல் தண்டுகளும் உணவுக்குச் சுவையூட்டும், வண்ணமூட்டும் பொருளாகப் பயன்படுத்தப்படுகின்றன. நீண்டகாலமாக உலகின் மிக விலையுயர்ந்த நறுமணப் பொருளாக (எடையின் அடிப்படையில்) குங்குமப்பூ இருந்து வருகிறது. குங்குமப்பூவில் எளிதில் ஆவியாகின்ற, நறுமணம் தருகின்ற 150 க்கும் அதிகமான சேர்மங்கள் உள்ளன. Flowers are considered important in our worship. We offer flowers to our Gods. Blooming flowers are one of the most beautiful things you can see in nature. The production of volatile chemicals in some flowers also make pleasant smell. It also attracts pollinating insects and spread a positive energy in the surrounding. Sweet fragrant smell is capable of transporting us to other places and times – some entirely unimagined. In some, Roses are the most popular choice; perhaps we see more jasmine here. Each flower has a unique smell. It is because of each flower produce a unique chemical compound. Crocus sativus, commonly known as saffron crocus, or autumn crocus, is a species of flowering plant of the Crocus genus in the Iridaceae family. It is best known for the spice saffron, which is produced from parts of the flowers. Saffron though not used as a flower is used as a paste anointing Lord. பூக்கள் அழகானவை; நறுமணம் தர வல்லன:: மல்லிகை, முல்லை, செண்பகம் தாமரை,மகிழம், ரோஜா, அல்லி மற்றும் விருச்சி, செங்காந்தள்; ஆம்பல்; அனிச்சம் ; குறிஞ்சி ;வாகை; வகுளம் ; கோங்கம்; என எவ்வளவோ நறுமலர்கள் உள்ளன. பூக்களை அழகாக தொடுத்து இறைவனுக்கு சாற்றி வழிபடுவது நெடுங்காலமாக உள்ளது. Swami Nammalwar says …. ‘the most pleasant fragrance of jasmine –wafting breeze, ears receiving the pleasing kurinji music; Sun setting with beautiful red colours in the horizon – all attracting - but more attracting was the pleasing sight of the fragrant palanquin made of flowers – for they were set for the most beautiful ‘Sriman Narayana’. For a Srivaishnavaite – thinking of Him, praising Him all the time, going to temples of His, doing services to His bhakthas and associating oneself in any form with various kainkaryams to the Bhagwan Shri Maha Vishnu are the only real things. Thirumala Thirupathi Temple – the sacred and most reverred temple of Sri Venkateswara is located on the seventh peak – Venkatachala hill of Tirumala. The Lord stands tall as bestower of all boons and lakhs of people reach here to have a glimpse – a few seconds darshan of the Lord. 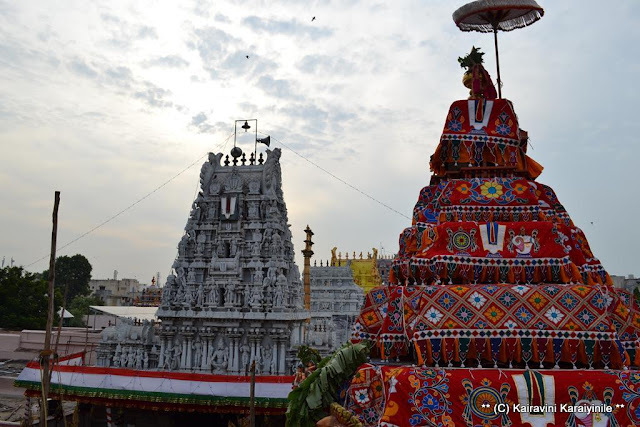 Tirumala Tirupathi Devasthanam which manages the holy shrine has lot of projects in and outside Thirumala. 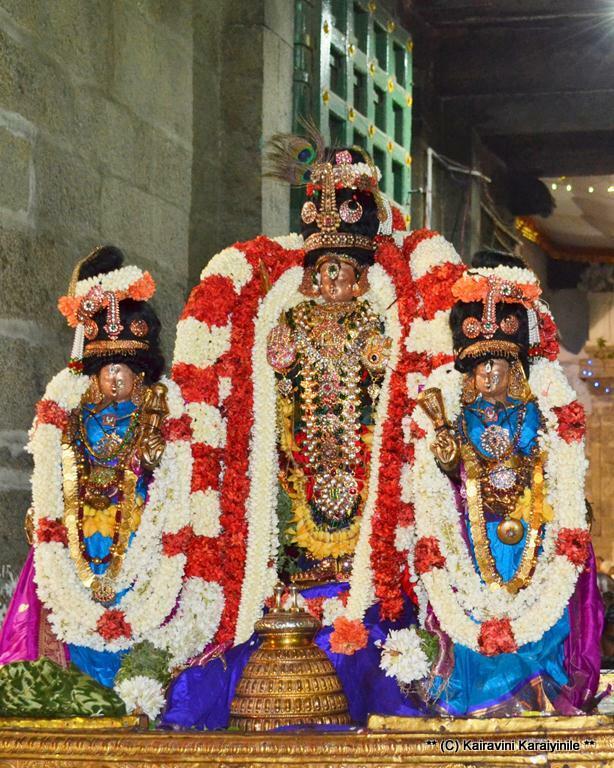 Srinivasa Kalyanam is being performed at various places – this Idol is not Swami Malayappar, the processional deity at the holy Thirumala Temple. Among the various projects, Dasa Sahitya Project propagates and popularises the literature of saint composers of Karnataka, popularly known as Haridasas, who enriched Kannada religious literature with their hymns. Through this project, TTD aims to acquaint people with the lives and teachings of Haridasas, spirituality, righteousness and morals and devotion to Lord Srinivasa in particular. Today [25th June 2016], at Thiruvallikkeni TTD Dasa Sahitya Project jointly with TKKNN Vyaya Charities is organising Sri Srinivasa Uthsavam at the premises nearer Vijay Avenue [ex Sri Parthasarathi swami sabha complex]. 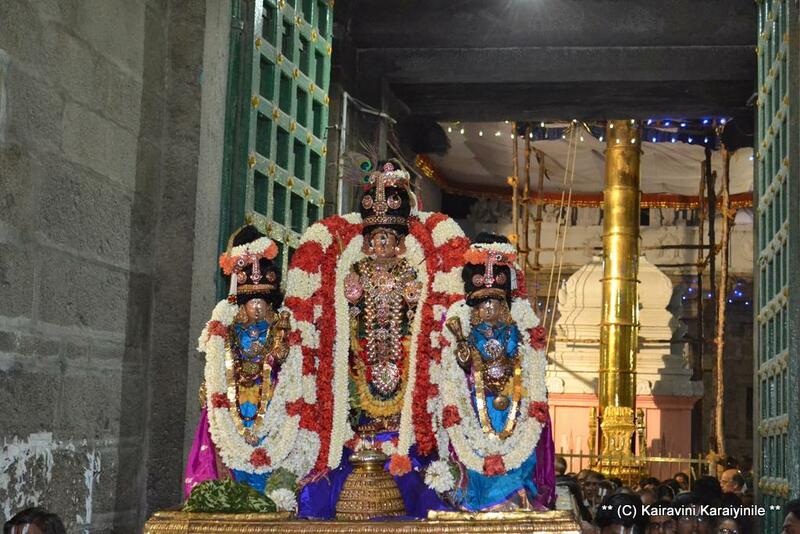 Hundreds of devotees had darshan of Perumal this morning. 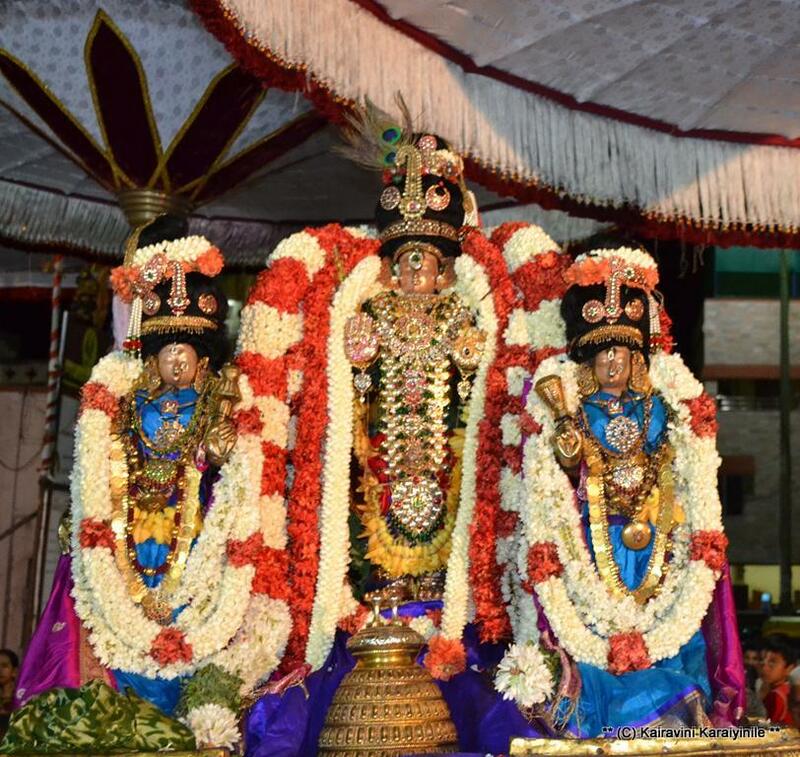 There will be Thomala seva, Thirumanjanam followed by Thirukalyanam in the evening around 6 pm. For land owners, especially in hilly areas, soil erosion is a major source of concern. There have been some research papers on the planting of ‘Chrysopogon zizanioides’ in effectively preventing soil erosion. It in fact is a perennial grass native to India, grows up to 1.5 meters high, its roots grow downward, two to four meters deep. Heard of ‘Chrysopogon zizanioides’ and wonder what is has to do with a Temple related post, especially one on the last day of Sri Thelliya Singar aani Brahmothsavam at Thiruvallikkeni. ‘Chrysopogon zizanioides’ is the scientific name of what is commonly known as ‘vettiver’ - which has many medicinal qualities. 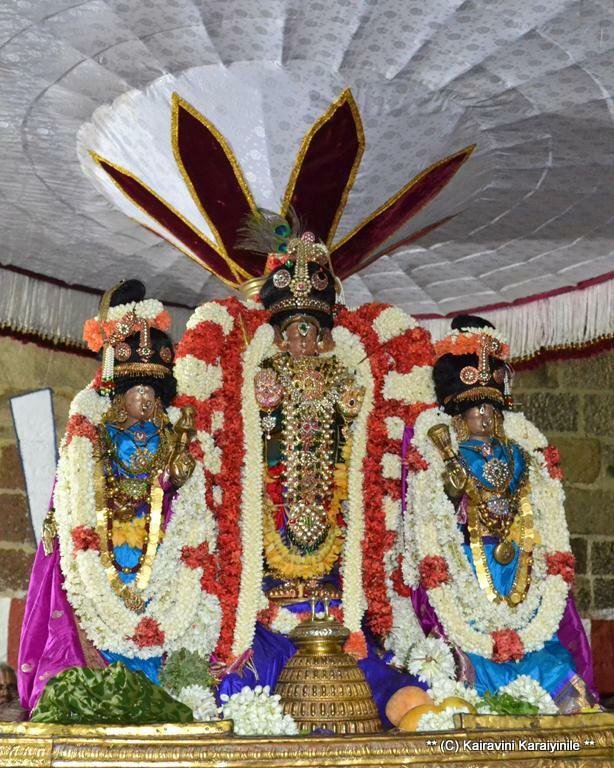 On the concluding day of Brahmothsavam is ‘Sapthavaranam’ – grand dwadasa (12) Thiruvaradhanam, rendering of Thiruvaimozhi pasurams in front of Sri Azhagiya Singar, Sri Parthasarathi & Andal, Sri Vedavalli sametha Sri Ranganathar, Sri Ramar and Sri Varadharajar - and later in the night, there is purappadu in Siriya Thiruther [the small chariot]. 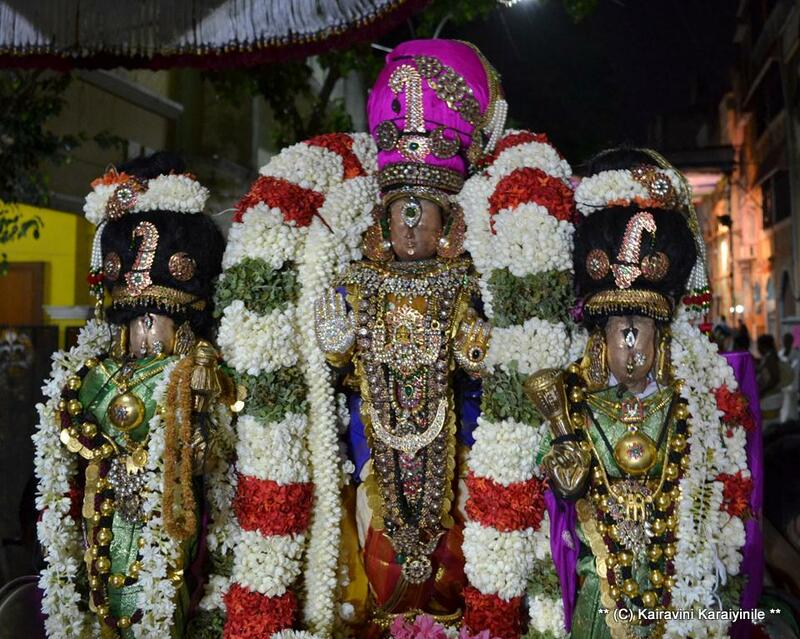 24th June 2016 was the tenth day of Sri Azhagiya Singar Brahmothsavam at Thiruvallikkeni [Triplicane] divyadesam. Veethi purappadu is in ‘Chinna Thiruther’ famously known as ‘Vettiver Chapparam’… I had earlier posted of the scientific name of vetti ver as - ‘Chrysopogon zizanioides’, a type of grass of Poaceae family, native to India. Also known as ‘khus’ Vettiver can grow up to 1.5 metres high and form clumps as wide. This Ther is known as ‘Vettiver Chapparam’ – for there used to be so many sheets made of this grass placed on the temple car. One could feel the divine fragrance from a distance itself. Here are a couple of photos of yesteryears. This year there was no vettiver mats and it was simple ther; in the purappadu - Thiruvarangathu Amuthanaar’s ‘Ramanuja Noorranthathi’ was rendered. This time, a new step stand enabling ascending and descending of Perumal to the Thiruther was first used Here are some photos taken during the purappadu. At Thiruvallikkeni, there are two dwajasthambams [kodimaram] and there are two Brahmothsavams – one for Sri Parthasarathi and the other for Azhagiya Singar. Both are grand ~ there are some minor differences. On day 8th morning it is ‘VEnnai thazhiK kannan’ for Sri Parthasarathi, while it is ‘Sri Lakshmi Narasimhar’ for Azhagiya Singar. On 9th day evening it is – Kannadi Pallakku – the palanquin embedded with beautiful mirror work. There was a big, captivating, eye-capturing palanquin made of glass – rather with glasses fitted all over and with chandelier like things suspended on its arms. Slowly it faded into oblivion as it was not maintained properly and glass pieces started falling as it was not maintained in the best manner. Then a newly made one – looking different than the earlier one was submitted. For Azhagiya Singar, there is no ‘kannadi pallakku’ but – ‘Punniyakodi vimanam’ – the Devasthana pathirikai calls it ‘Satha darsha vimanam’. திருமங்கை மன்னன் நமக்கு உரைக்கும் அமுதம் :-: 'நலம் தரும் சொல் : நாராயணா என்னும் நாமம்'... கலியன் மேலும் அருளுகிறார். கண்ணபுரத்து உறையம்மானே : வேதங்கள் ப்ரதிபாதிப்பது பரம்பொருளான ஸ்ரீமன் நாராயணனை மட்டுமே ! ~ எம்பெருமானை தவிர வேறு தெய்வம் உள்ளது எனும் மனம் கொண்ட மாந்தரோடு இருக்ககில்லேன்; எம்பெருமான் அடியார்களிடம் மட்டுமே அடிமையாய் இருப்பேன்.. எம்பெருமானிடம் அடையவல்ல அஷ்டாக்ஷரமான எட்டெழுத்து மந்திரத்தை தெளிந்த பின் என்கிறார். Thirumangai mannan in this pasuram says : Oh Lord of Thiruk Kannapuram, I shall have nothing to do with those who think that there are other Gods too. Having learnt the glorious eight syllable [Ashtaksharam] and its meaning, the only thing I desire and do is to service Your devotees. 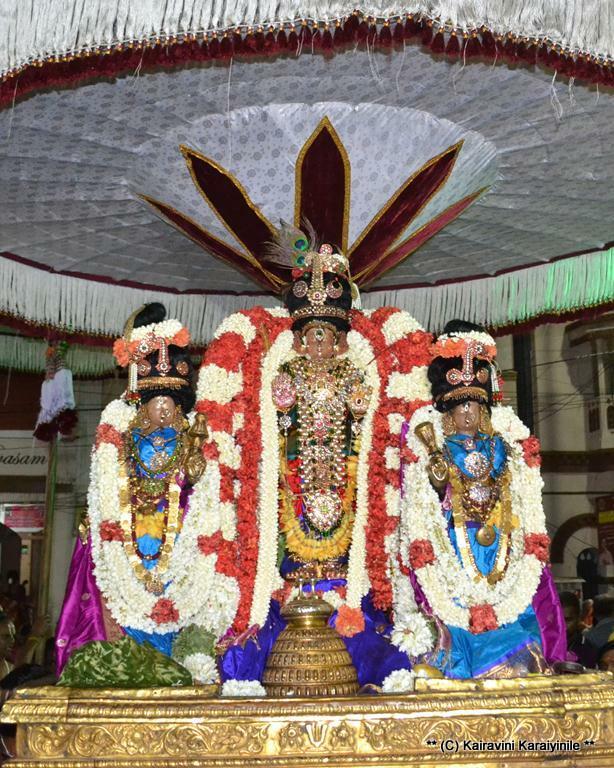 At Thiruvallikkeni this evening, there was purappadu in ‘Tholukku Iniyaan’ from Thelliya Singar sannthi via Peyalwar Kovil street, thence it was purappadu in vimanam – first Kairavini Thirukulakkarai and then periya mada veethi. Here are some photos of the purappadu. Today, 21st June 2016 is day 7 of Sri AzhagiyaSingar Aani Brahmothsavam – the grand Thiruther [chariot]….. one will realise its grandeur that of rolling juggernaut, if one were to stand near as the 8 or 9 feet wheel rotates by. Thiruther is a grand occasion of togetherness of people. 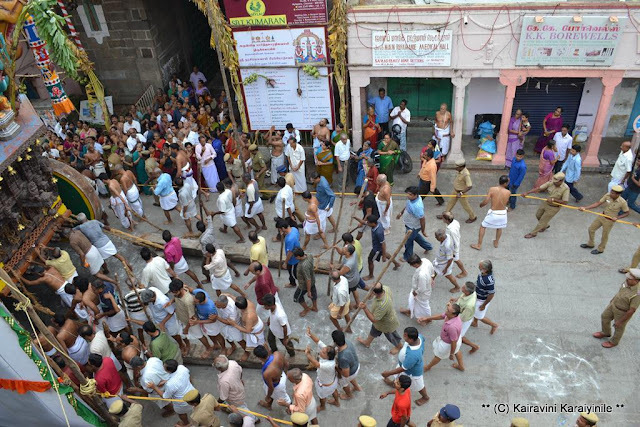 During Brahmothsavam thousands throng Temple and have darshan of Perumal in His veethi purappadu ~ significantly, during Thiruther, thousands partake – they pull, go around, push, offer buttermilk and panakam [jaggery water] to devotees and there is celebrations on the air, clearly visible. Could recall that the Thiruther of yore was even bigger ~ in 1980s for a couple of years, there was no Thiruther purappadu as it was under repair – when made again, in tune with times, it got reduced a bit – also now it has steel wheels; the earlier one had wooden wheel… it now runs on concrete cement road. 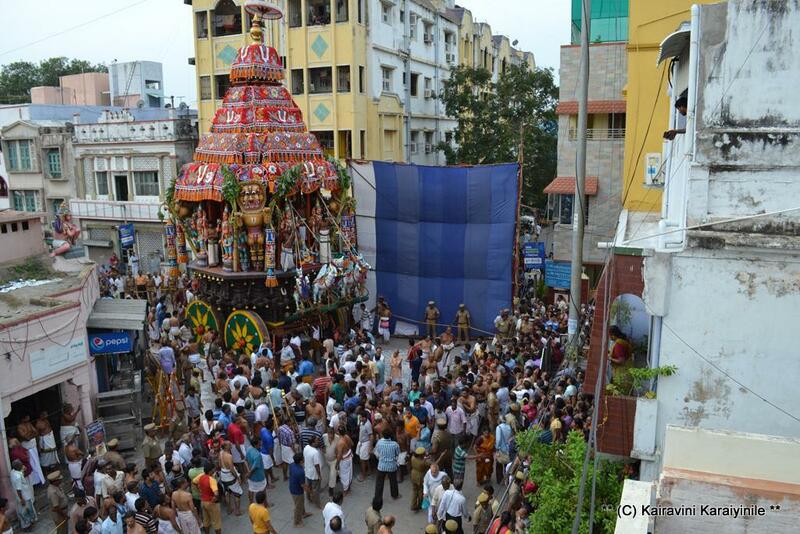 Thiruther, the chariot, is easily the most grandeur and most attended by bakthas too. 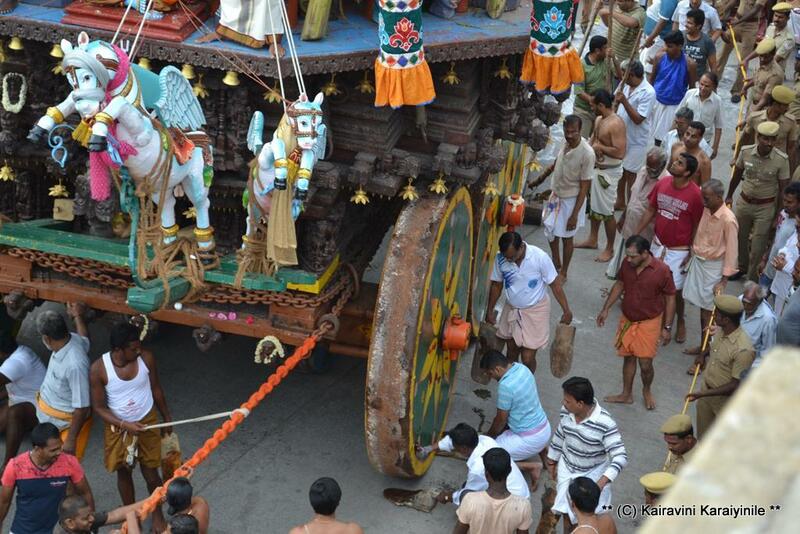 Ratha [the chariot] has existed in puranic days, historic days and more. We have heard of Kings of recent past having had platoons of horse and horse-driven chariots. On screen too, we have seen many – one got enamoured by the scene of Arjuna wading through the forces in Mahabaratha - even those chariots were quite attractive. Ratha is not only fleet-footed mode during war, it symbolizes energy and zeal to move forward. It was on the chariot steered by Lord Krishna, Geethopadesam occurred to Arjuna, the mighty warrior. 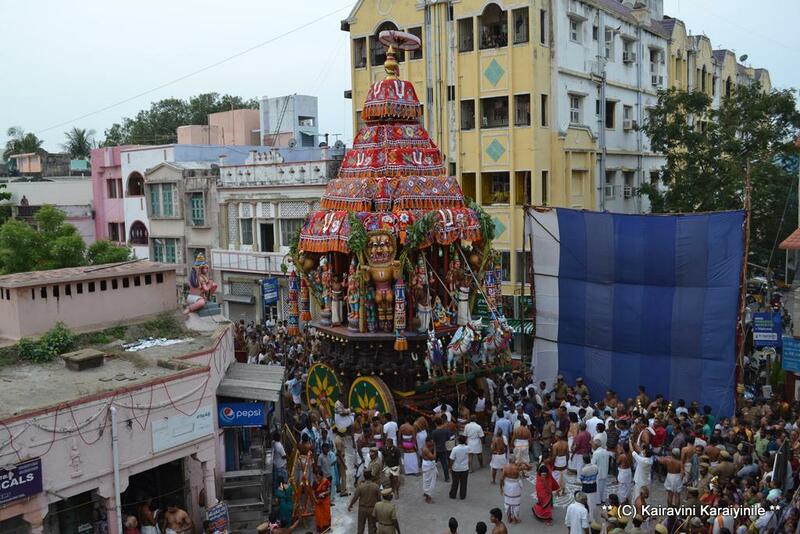 The rath itself according to legend was given by Agni. The battle formation was unconceivably bigger ~ by some accounts an Akshauhini is described as a formation consisting of 21870 chariots, 21870 elephants, 65160 cavalry and more than a lakh of infantry. Odisha’s king Narshimhadeva, the first of Eastern Ganga dynasty, decided to make a huge temple complex consisting of four temples dedicated to the Sun god in 1255 AD. The site chosen by the architects was in the north-eastern corner of Puri, one of the four sacred dhams – Konarak, Bhubaneswar. The Konark temple is designed in the form of the chariot of the Sun god. It has 24 wheels and seven horses. 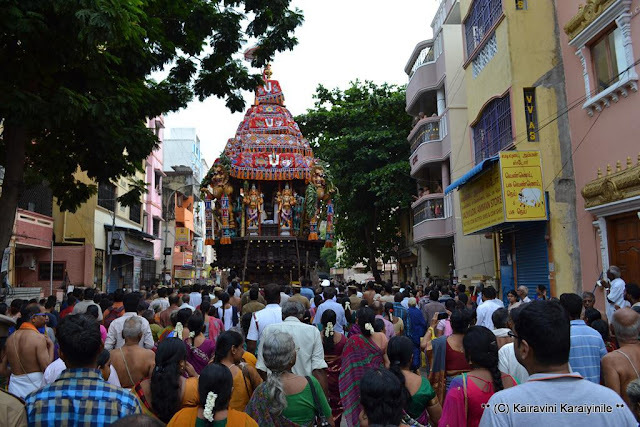 It was a grand festive day at Thiruvallikkeni Divyadesam – the chariot was pulled at 07.00 am and reached back the place by 08.30 am ~ it was heavenly. 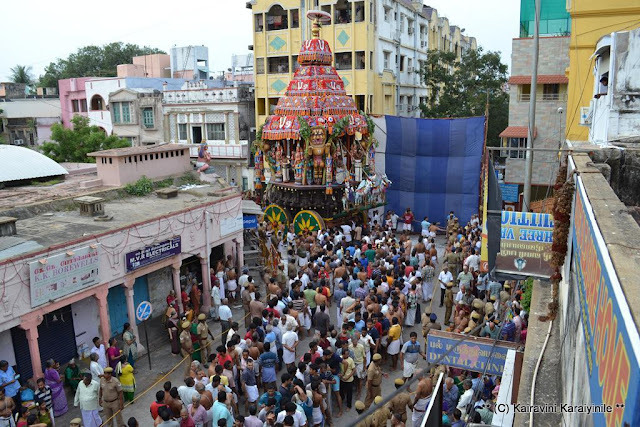 In the goshti, it was Thirumozhi of Thirumangai Mannan. Kaliyan advises us (saying unto his heart) : the supreme Lord residing in Thiru Oorakam and Thirukudanthai, is the one who by His bow killed those rakshas of the sena of Ravana. That Lord of Thirupper resides in the temple surrounded by fertile fields with chirping water birds, the One who is worshipped with thousand namas – to Him, the heart should go and be blessed by the divine. திருவூரகம் திவ்யதேசத்து எம்பெருமானும், திருகுடந்தையிலே புருஷோத்தமனாகவும் சேவை சாதிக்கும் பெருமான் ஸ்ரீ ராமாவதாரத்திலே தன்னுடைய வில்லினினாலே, இராவணனது அரக்கர் சேனையை சிதைத்தான். நெஞ்சே, ஆயிரம் பேர்களாலே புகழப்படுபவனும், வண்டுகள் ரீங்காரம் இடும், நீர்ப்பறவைகள் நிறைந்திருக்கிற வயல்களாலே சூழப்பட்ட ஸ்ரீசாளக்ராமத்திலே எழுந்தருளி இருக்கும், அப்பெருமானிடல் சென்று சேர். The ancient kingdoms of South India had perennial rivers, monsoon forests and many elephants. Elephants played a great role in many wars and were treated as a great wealth for the Kingdom. The anthologies and epics of Sangam literature have given heroic admiration to elephants. Elephants are majestic – the special battalion of elephants was sought after … its thick hide would protect from injury ~ the high riding portion gave the rider a good view to attack… At Thiruvallikkeni divyadesam, on day 6 evening, it was ‘Yaanai vahanam’ for Sri Azhagiya Singa Perumal ~ the one at Thiruvallikkeni is in sitting posture with golden hue. This elephant standing tall like a statue was taken at Ambalappuzha Sri Krishnan Temple in Kerala, in Alapuzha district. This temple is believed to have been built during 15th AD by Chembakasserry Pooradam Thirunal Devanaryanan Thampuran. The idol here too is Sri Parthasarathi with a whip in right hand and shankam [conch] in the left. Any such elephant makes me nostalgic about the affable, majestic tusker ‘Azhwaar’ ~ the one that lived at Thiruvallikkeni which never misbehaved. 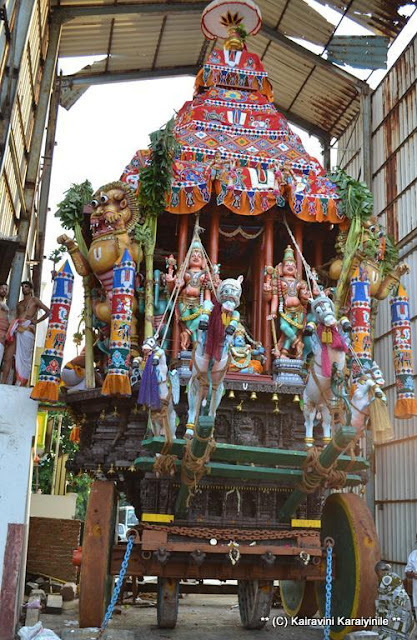 This gigantic one would be bathed, decorated with Thiruman on its forehead and would accompany perumal purappadu. 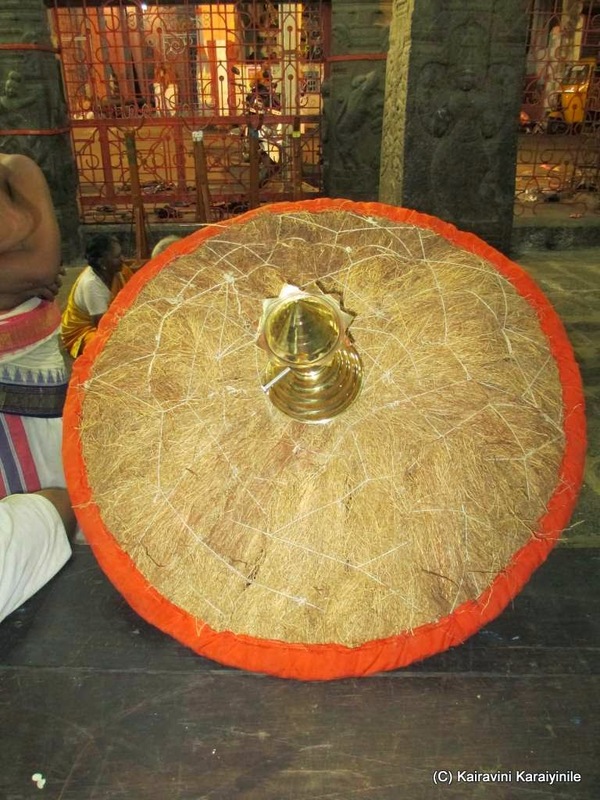 At the end of the purappadu have seen Azhwar offering ‘saamaram’ to Perumal and would walk backwards. It used to carry sacred water (Thirumanjana kudam) from the temple tank, being taken in a procession every morning. திருவல்லிக்கேணியில் சிறப்புற நடைபெறும் திரு அழகியசிங்கர் ப்ரம்மோத்சவத்தில் ஆறாம் நாள் இரவு கம்பீரமான யானை வாகனம். யானை பார்க்க பார்க்க கம்பீரம். ஆண் யானைக்கு களிறு என்று பெயர். பெண் யானைக்கு பிடி என்று பெயர். தமிழ் சங்க இலக்கியங்களில் யானை, வேழம், களிறு, பிடி, களபம், மாதங்கம், கைம்மா, வாரணம்,குஞ்சரம், இருள், தும்பு, வல் விலங்கு என பல்வேறு பெயர்களால் அறியப்பட்டதாக அறிகிறோம். யானை தந்தத்திற்கு கோடு, மருப்பு போன்ற பெயர்கள் வழங்கப்பட்டன. பண்டைத்தமிழ் அரசுகளில் யானைப் படை முதன்மையான பங்கு வகித்தது. படை யானைகளுக்குப் பெயரும் பட்டங்களும் வழங்கப்பட்டன. பெரும்பாலான தமிழகக் கோவில்களில் யானைகளின் சிற்பங்கள் செதுக்கப்பட்டிருக்கும். பண்டைய காலத்தில் உருவான ஒவ்வொரு கலைப்படைப்பிலும் யானைகளைப் பார்க்கலாம். சிற்பங்களிலும் சரி, இலக்கியங்களிலும் சரி யானைகளுக்குத் தரப்பட்டுள்ள இடம் தனித்துவச் சிறப்புடைய ஒன்று. யானை மீது அமர்வது உயர்வானதாக கருதப்பட்டது. யானை புக்க புலம் போல"" - பிசிராந்தையார் - மன்னன் அறிவுடை நம்பிக்கு வழங்கிய அறிவுரை மிகவும் சிந்திக்கக் தக்கது. அந்த வரிகளின் அர்த்தம் : விளைந்த நெல்லை அறுத்து உணவாக்கி யானைக்குக் கொடுத்தால், அது யானைக்கு பல நாட்களுக்கு உணவாகும். ஆனால், நூறு வயல்கள் இருந்தாலும், யானை தானே புகுந்து உண்ண ஆரம்பித்தால், அவ்வுணவு யானையின் கால்களால் மிதிபட்டு பெருமளவில் அழியும். அது போல அரசனானவன் வரி திரட்டும் முறையை கட்டமைத்து மக்களை வருத்தாமல் வரி வசூலிக்க வேண்டும். திருவல்லிக்கேணி யானை வாஹனம் அமர்ந்த நிலையில், தங்க பூச்சுடன் ஜொலிக்கும். வாகனத்தின் மீது வெண்பட்டுடுத்தி, பெருமாள் பின்பு பட்டர் அமர்ந்து சாமரம் வீசி வருவது தனி சிறப்பு. யானை வாயில் வாழை மரங்கள் வைத்து, நிஜமான களிறு ஓடி வருவதைப் போல் இருக்கும். யானை வாகன புறப்பாட்டில் 'ஏசல்", "ஒய்யாளி" என்று அழைக்கப்படும் சிறப்பு உண்டு. துளசிங்க பெருமாள் கோவில் தெருவில், ஸ்ரீபாதம்தாங்கிகள் மூன்று தடவை வேகமாக முன்னும், பின்னும் ஏளப்பண்ணும் வைபவம் இது. முதல் இரண்டு தடவைகள் சிறிது தூரம் ஏளப் பண்ணிய பின்னர்,மூன்றாவது தடவை, முழு தெருவும் வேகமாக எழுந்து அருள்வார். திரும்பும் போது, மிக துரித நடையிலும், அழகாகவும் ஏளப்பண்ணுவர்கள். பார்ப்பதற்கு யானை பீடு நடை போட்டு வருவதை போல் இருக்கும். திவ்ய பிரபந்தத்தில் யானை பல இடங்களில் குறிப்பிடப் படுகிறது. பெருமாள் ஸ்ரீ மகாவிஷ்ணு, கஜேந்திராழ்வானை முதலை வாயினின்றும் விடுவித்துக் காத்தருளினமை ப்ரஸித்தம். இதையே பொய்கை ஆழ்வார் 'பிடி சேர் களிரளித்த பேராளா' என்கிறார். மூன்றாம் திருவந்தாதியில் பேயாழ்வார், திருவேங்கடத்தில், மேகங்களை தவறாகப் புரிந்து கொண்டு, தனது துதிக்கையை எடுத்துக் கொண்டு வேகமாயோடி குத்த ஓடுமாம் மத யானை - அந்த யானை திருமலையில் உறைகின்ற வேங்கடவனை என்றென்றும் துதித்து வணங்குமாம். "வேங்கடவனையே கண்டு வணங்கும் களிறு" - என்கிறார். யானை மீது அமர்வது உயர்வானதாக கருதப்பட்டது. குலசேகரர் அழகிய திருமலையிலே ஏதாயினும் இருக்கும்படியான பாக்கியம் கிடைத்தால் யானையின் மீது அமர்வது கூட வேண்டாம் என்கிறார். தன்னைக் பார்க்கின்றவர்க்கு அச்சத்தால் நடுக்கத்தை விளைக்கின்ற மதங்கொண்ட யானையினது கழுத்தின் மீது அமரும் சுகங்களையும், ஐசுவர்யத்தையும் அரசாட்சியையும் விரும்ப மாட்டேன்: எமது தலைவனும் எம்பெருமானுமான ஸ்ரீமன் நாராயணன் வாழும் அழகிய திருமலையிலே புதராய் நிற்கும்படியான பாக்கியத்தை உடையவனாகக் கடவேன் ~ என்பது குலசேகரர் வாக்கு ! !